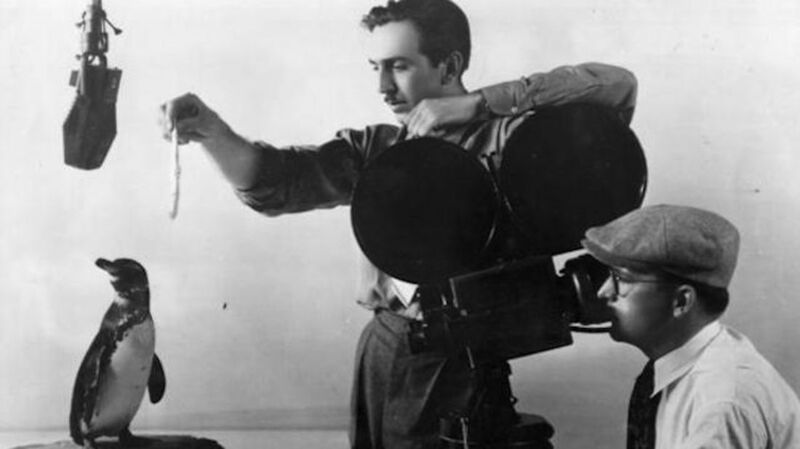 When Walt Disney first arrived in California, he had a demo reel, no money, and few prospects. He got a lucky break, however, when an east coast film distributor named Margaret Winkler contacted him about a pitch he had sent the previous year. Walt had developed a small demo called "Alice's Wonderland," which mixed live action and animation. It starred a (real) child actress and her imaginary (animated) friends. Winkler had finally gotten around to reading his pitch, and was interested to see what else Disney might be able to produce. She offered him a contract to make two series of 12 films each. Her financial offer: $1500 for the negatives of each of the first six films, $1800 for the remaining six, and the rights to everything Walt produced while the contract was in effect. It wasn't a great deal, but with no prospects or bargaining position, he signed the contract. The first thing Walt did was ask his brother, Roy, for help; the two men approached family members to ask for money. They were initially rebuffed, as Walt still owed them money from a previous, failed animation venture. In the end, they only managed to secure small loans ranging from $25 to $500. It was enough to rent a small lot for filming, a new camera, and necessary wood and tools. They called their new company Disney Brothers Studio. "It was essentially a two-man operation," writes Neal Gabler in his stellar biography, Walt Disney: Triumph of the American Imagination. "Walt conceived the stories, directed the live action, drew the animations, and timed the exposures so that the movements were smooth. Roy did the books, occasionally manned the camera, and even washed the cels so that they could be reused." The Alice pictures started making money, and the next year, Disney Brothers Studio hired three women and three men to work as inkers, painters, animators, and camera operators. Winkler now wanted two films per month. Then, as had each of Walt's previous animation ventures, Disney Brothers Studio hit a wall. Winkler got married, and when she became pregnant, her new husband, Charles Mintz, took charge of her company. Mintz had his own ideas about the Alice pictures, and roundly dictated expensive changes to submitted films—a serious problem for Disney Brothers, which turned only the slimmest of profits. Mintz had them in a corner, though, and everyone knew it. If he refused to accept the Alice films, he was under no obligation to pay for them—and Disney Brothers needed that money to remain solvent. After Mintz began approving pictures again, he negotiated a new contract with Disney Brothers that required 26 shorts for $1500 each, to be paid in installments after the submission of a completed film. This was a much worse deal than was the previous contract. The velocity of work increased and the pay decreased. Still, the series was growing in popularity and receiving strong notices in trade papers, and the Disney brothers agreed to keep producing them. To accommodate the increasing workload, Disney Brothers Studio renovated a building on Hyperion Avenue in Los Angeles. With the new studio came a new name for the company: Walt Disney Studios. It was a characteristically optimistic move by Walt, yet striking for a company in financial peril. But that was Roy's problem—Walt had cartoons to make. Quality came at a cost, though, and by the end of the Alice series, the studio was actually losing $61.25 per picture. It didn't help that animation—never a moneymaking proposition—was beginning to lose its novelty among theatergoers. Salvation came in the form of a lucky rabbit named Oswald. Until then, by and large, animations produced by the industry were collections of gags whose unifying force was sometimes a central character: Felix the Cat, for example, or Julius the Cat (Alice's animated sidekick). The character didn't actually matter because the character wasn't the point. Walt decided to elevate his stories by making his characters real and fleshed out. Oswald would be his first attempt at this; he wanted "to make Oswald peculiarly and typically OSWALD," he said. Gags wouldn't happen to Oswald, but rather would happen because of Oswald—because of who the character was. He would be a character "conscious of his body" and "capable of enjoying pleasure and suffering pain." After initial pushback from Mintz, the Oswald series went forward and was an instant success. Money followed, and the company expanded to a full 22-person studio to produce more Oswald shorts. In the process, the studio had established itself as a gold standard in animation: Disney's artists knew how to make cartoons, and were only getting better at it. Then Charles Mintz decided to get rid of Walt and take over Walt Disney Studios. What happened was this: As head of his small studio, Walt no longer worked as an artist. He lacked the time, and he simply wasn't as good a cartoonist as the best under his employ. Mintz knew this, and couldn't figure out what Walt was good for, exactly. Mintz figured that he or a proxy could easily run the studio, and because of the contract Walt had signed, Mintz owned Alice, Oswald, and everything else the studio had ever created. Why deal with Walt at all? Mintz mounted a two-pronged takeover attempt. First he negotiated a new, three-year distribution deal with Universal to provide Oswald shorts for Universal's features. With that done, he approached Disney's art team directly, asking them to sign contracts to work on the the new Oswald shorts. Many did, unknown to Walt. The Universal deal meant that Walt and Mintz would have to work out the details for a new contract, which is where Mintz dropped the hammer: he offered a much less lucrative deal for the studio, and in the contract was a provision promising "substantial salaries" for Walt and his brother. As Gabler writes, this "suggested that Walt was not a studio owner in his own right but a subcontractor for Mintz." Walt rebuffed the offer, but the terms of the next contract were even worse: a $50 increase in the price per picture, 50 percent of the profits, and Mintz would take over Walt Disney Studios, paying Walt and Roy $200 per week as employees. Walt walked away from the negotiations, but was in a terrible bind. His studio was under assault, he had no intellectual property, Oswald had been stolen, his artists were gone, and he had no plan to fix any of this. On the train ride back from New York, where the negotiations had gone so horribly wrong, Walt came up with the idea for a mouse. With a new character—he was certain the world would love Mortimer—and a hard-learned lesson in show business realities, Walt set about rebuilding the studio. You already know how things worked out.